You can evaluate female employees’ job performance in annual reviews – you can even claim you’re ‘developing’ them. But if you pay them lower wages than their male counterparts and you don’t provide clear performance criteria for these annual reviews – then they’re most likely going to quit anyway. These are, very loosely, the findings of the new report from Catalyst, High Potentials in Tech-Intensive Industries: The Gender Divide in Business Roles. This highlights the sheer depth of inequality in STEM jobs and suggest that the gender bias goes much further than a mere lack of women in tech industries. Based on a global study of 5,916 MBA graduates it reveals that women are opting out of STEM at various stages of their career. First off, less women are attracted to business roles in STEM jobs to begin with. And second, more than half (53%) of women who do start in these industries after graduation, end up leaving for a different industry. This compares to 31% of men surveyed. The findings also state that women are on an unequal footing from the go get. In fact, despite having the same level of education as their male colleagues, (16%) more women start in entry-level positions and are therefore paid less throughout their time with the company. They were also more likely to work on a team with 10%, or fewer, women. This translates to less than a third (27%) feeling “similar to most people at work” compared to 83% of men. I asked Anna Beninger, Research Director for a bit more information. She explains: “To give you a concrete example, a woman working in finance in a technology company may have the goal ‘exhibits strong leadership skills’ in her annual performance review. This is a very vague statement, and a manager can very easily be swayed by unconscious biases that associate masculine leadership skills with ‘strong leadership.’ It would be very easy for a manager to say, ‘I don't think you've quite met this goal, so you're not ready to be promoted yet to the next level or take on management responsibilities.’"
This does all sound a little overplayed to me. Surely the former is simply the textbook definition of poor management: don’t provide clear objectives and then blame employees who don’t fulfil on them. 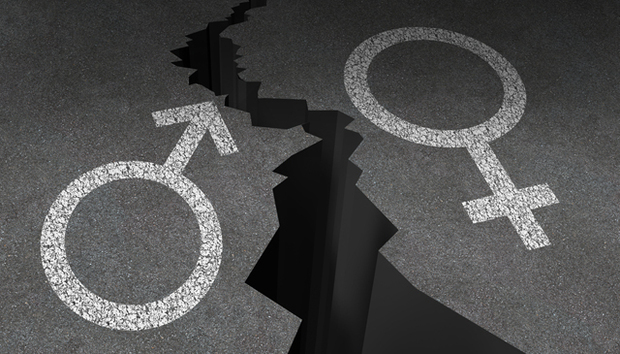 It is an obvious fault-line in any problematic company structure, but does it really have anything to do with gender? Beninger does feel this specifically comes down to the imbalance: “The difference between these two organisations is awareness of gender norms and how unconscious biases can unintentionally influence performance evaluation practices,” she explains. “Tech-intensive organisations are heavily male-dominated and lack the awareness of how their practices negatively influence women. For many, they have always done things a certain way and it's been fine because they want to reinforce the status quo. But this results in organisations missing out on high potential talent." So men don’t feel the same about this vague evaluation criteria? "We didn't find that men in tech-intensive industries perceived their evaluation criteria to be more vague than men in other industries,” she says. “This is likely because men embody the masculine leadership norm that continues to dominate workplaces today. Leadership characteristics have become synonymous with male traits (e.g., assertive, action-oriented, results-driven). Subsequently, men are often promoted on potential while, by comparison, women are promoted on proven performance." The outcome of this report is a series of concrete suggestions on what organisations can do to stop this brain drain. These include evaluating the company culture, starting men and women at equal pay grades, providing a flexible work environment, recruiting senior male executives to sponsor up-and-coming women, and making performance standards crystal clear. This all sounds like sensible advice. Though I must admit the performance criteria point had never struck me as a gendered issue before. What do you think?